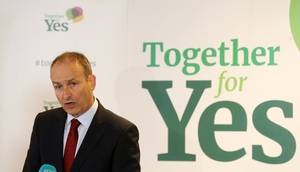 An address by Fianna Fail leader Micheál Martin to a Lawyers 4 yes meeting. “There are just over two weeks left before polling in this referendum. By the time it is over this will have been one of the broadest and most detailed referendum debates we have ever held. 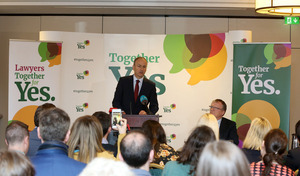 In many ways the campaign began in January when it became clear that the Oireachtas would support the proposal adopted by the all-party committee. I believe that the logic and core humanity of the all-party recommendations have absolutely withstood scrutiny. These recommendations involve a regulated regime which reflects medical reality and address the clear failure of the present law to provide even basic care and compassion for many women at what is one of the toughest moments of their lives. 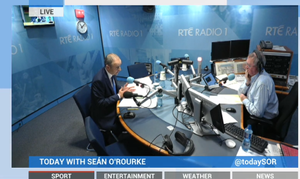 Since I made my personal statement in the Dáil I have visited many parts of the country and have talked to hundreds of people about the referendum. For those who have disagreed with me I have met a very open and respectful tone. All of the evidence is that the public is becoming very well informed on the issues at hand. It can be very difficult to see through a passionate debate – particularly when faceless groups are appearing and spreading dishonest and offensive material. However I believe that people are intelligent enough to see through this – and I would encourage everyone to focus on the materials provided by reputable and officially registered groups as well as the Referendum Commission. 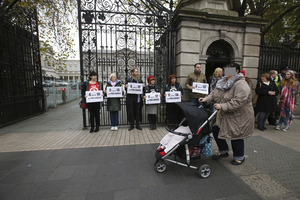 I believe that people increasingly understand that abortion is an everyday reality in Ireland. There is no option available to make Ireland abortion-free. What we are being asked to do is to remove a 35 year-old provision in the constitution which has not only failed to make Ireland abortion-free it has inflicted considerable harm. There have been many attempts to change the tone and outreach of support services. There have been many court cases and attempts to slightly alter the impact of the amendment. But what has become clearer and clearer is that 8th amendment hasn’t worked because it cannot work. In fact it has quite obviously increased the likelihood of difficult circumstances becoming a crisis for pregnant women. At the very core of the 8th amendment is a judgement and a completely inflexible one at that. The 8th amendment hasn’t made abortion the last resort, in fact it has made abortion the only option for many women. Faced with a deep crisis the first consultation the woman has is often with the internet, to find flights and addresses rather than with a medical professional here who can outline different options and ensure proper and safe care. There is persuasive evidence that the liberalisation of abortion laws in some countries has actually led to a decline in abortion rates. This makes complete sense because reduced pressure and an increased engagement with support services creates choices which are simply not there otherwise. There is no reason why this could not be the case in Ireland as well. The specific proposals of the all party committee provide for a new approach where we can help women in Ireland faced with terrible situations which simply cannot be addressed while the 8th amendment remains in the constitution. The law as it stands demands that we try to force a woman to carry a pregnancy to term irrespective of the impact on her health, or if she was raped, or if she has received a diagnosis of a fatal foetal abnormality. And it is essential people understand that there is no possible way for this to change if the amendment remains. The Supreme Court has held, and left no room for doubt, that a constitutional prohibition must be reflected in the policy of the state, in its primary law and in its criminal code. There is no discretion and there is no way of thinking that we can address these cases without removing the 8th amendment. We should all remember that five years ago many people claimed that abortion on demand was being introduced because limits in that legislation wouldn’t be respected. Those claims turned out to be false. Women and their doctors have fully respected the strict limits in that law – and they will respect whatever law is introduced. I deeply understand how uneasy many people are with the choice to be made on Friday May 25th. For a lot of people, including me, coming to a conclusion has been a long and challenging process. Each of us has a personal responsibility as a citizen to decide where we stand. This doesn’t have to be without reservations, but it does have to involve a frank and honest look at the reality of Ireland today and in the future. A No vote on the 25th will mean that nothing will change. There will continue to be a long stream of cases through our courts taken by women facing extreme situations and identified only by a letter of the alphabet. There will continue to be thousands of Irish abortions every year with no engagement with medical professionals. There will continue to be a rising number of unsupervised and unregulated abortions taking place here with the use of abortion pills. 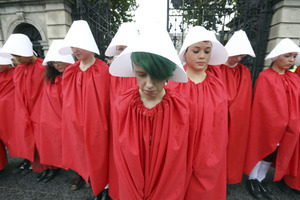 A No vote will mean that Ireland will continue to be a cold place for women in the most terrible circumstances – and we will continue to be confronted by case after case of cruel insensitivity. A Yes vote will enable a system where the first consultation a woman facing a crisis has is with a medical professional who can support her and outline different choices. It will enable a system which is regulated, safe and humane. It will bring to an end the failures of the 8th amendment. Posted in Misc and tagged Micheál Martin, The Eighth Amendment at 6:10 pm on May 9, 2018 by Bodger. Crocodile tears from a worried FFailure who wouldn”t know a regulated system from an expenses form. Ball not man. We’ll be having those balls in due course. why has Broadsheet got No ads over the masthead…or at all? Mine are still sponsored by The Iona Institute. Anyways, here is a sing song from Young Fathers. Played Dublin last month, I am so out of touch. Anyways this keeps stalking me on YouTube. It’s about a poor immigrant young man with a very fit body. Among other things. Of course on Broadsheet, even if an FFer says something that the readers agree with, the the small minded broadsheet commentors rush to run it down. 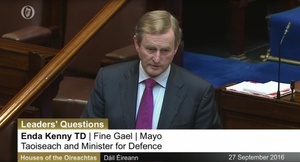 The comments section here is filled with SocDems and Shinners… well done Micheál can’t be easy in FF. Even broken clocks are right twice a day. They don’t get praise for it. If only Martin was gone and the old legacy could finally be swept aside and then maybe just maybe we could think that maybe Fianna Fail might be different. Maybe with a new generation of Fianna Fail we could begin to believe their words are not entirely motivated by their desperation to be in power again. Not that I expect any of the old Fianna Fail supporter to understand any of that. 31 FF TDs and Senators had their group photo taken last week as part of their campaign to Retain the 8th. There’s a lot more that Mícheál Martin to get rid of. That’s a lot of antiquated thinking. It shows the calibre of politician FF are fond of. I hope people aren’t going to be foolish and cast a No vote as protest against a political party. that would be utterly idiotic. vote as you personally want to vote, it’s a referendum not an election. Which is why the Yes vote is dropping in every poll. Except for England and Wales, obviously. Why is England and Wales different? Is it to with the stats before and after perhaps? Or the fact that it was introduced so long ago? VOTE FIANNA FAIL. Then shaft Martin when it doesn’t win enough seats. pity he didn’t care this much about women when the ladies from Drogheda needed his help all those years ago.